Brie's life ends at sixteen: Her boyfriend tells her he doesn't love her, and the news breaks her heart - literally. But now that she's in heaven, Brie is about to discover that love is way more complicated than she ever imagined. Back in Half Moon Bay, her family has begun to unravel. Her best friend knows a secret about Jacob, the boy she loved and lost - and the truth behind his shattering betrayal. And then there's Patrick, Brie's mysterious new guide and resident Lost Soul who's been D&G (dead and gone) much longer than she… and who just might hold the key to her forever after. With Patrick's help, Brie will have to pass through the 5 stages of grief before she's ready to move on.…But how do you begin again, when your heart is still in pieces? I do not even know what to write about this book. This was a total cover buy from my local library. I thought it was your typical contemporary romance, but then I saw on Goodreads that this was Fantasy and Paranormal. I have been putting off reading it since I saw that. When I saw this was part of the Audible romance section, I decided it was time to give it a try. The sections are broken up into the Stages of Grief and I felt anger, acceptance, and sadness while reading this. I would not say this was fantasy, as this deals with a 15 year old who passes away and is in the afterlife. I had Ghost (the movies) vibes in this, but with so much more to it than that. Brie is reflecting back on her life (friends, family, losing her life at such a young age). There were times were it was very sad, and there are some twists and turns along the way. I did not see the twist coming at all! I was not a huge fan of the ending, but I expected it since this is Young Adult. I loved that each chapter was a song name, and songs were used throughout. There were also several Disney references which I also enjoyed. This was definitely an unexpected read for me, and I really enjoyed it. 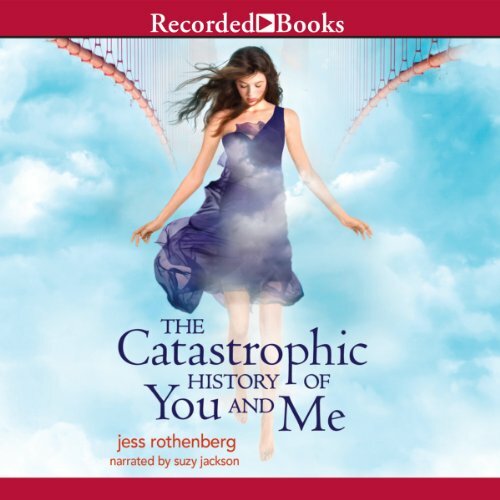 Could you see The Catastrophic History of You and Me being made into a movie or a TV series? Who should the stars be? This book is about Brie, who dies, literally, from a broken heart. Brie isn’t quite ready to move on, and meets Patrick in the space between moving on, and the real world. I liked the very beginning of this, thought it was amusing, Brie is talking about love, and claims love is like being eaten alive by a grizzly bear. I’ll admit, that was the reason I got this book, THAT LINE. Brie was 15, almost 16, so there were mentions of school, and dances and general teenage life stuff that totally had me going back to those horrifying moments of my teenage years best left forgotten. Overall, predictable. As far as the basic plot line went. Why Jacob broke up with her, who Patrick really was. There were some amusing parts, cheese themed nicknames, I like! Parts that were really depressing, the people left behind dealing with the death, too close to home for me thank you very much. I can’t say I didn’t like it, but I’m not sure I really liked it either. I think I’m mildly indifferent to it.